There are few tools as integral to a smoker’s kit as lighters. Since their invention, lighters have become the un-matched standard for igniting cigars, pipes and cigarettes of all varieties. Furthermore, the inherent efficiency, functional necessity, compact size, low cost and reliability of lighters make them a must-have staple in every dispensary, tobacco store and smoke shop. 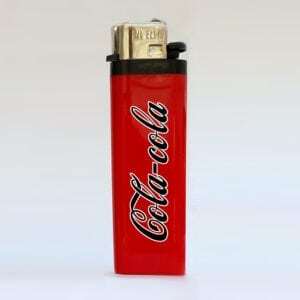 Furthermore, many people carry lighters as part of their jobs or day-to-day activities despite not even being smokers. You may find lighters in the purses and pockets of teachers or day-care workers to light birthday candles, scented tea lights or gas pilots such as those in kitchens and science lab Bunsen burners. Servers and hospitality workers often carry them as a courtesy for guests. Let’s not forget, the usefulness of lighters don’t stop at cigarettes. Some other common everyday uses include lighting candles, incense, fireplace logs and even opening beer and soda pop bottles! 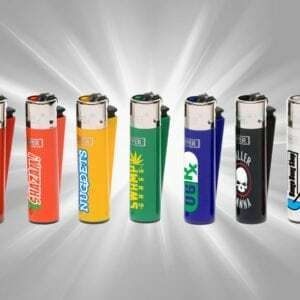 One of the great things about lighters is that they are superbly well-suited as a canvas for cool, catchy designs, brand logos, bold colors, personality flavor and even fashion statements. The biggest brand in the lighter industry (Bic) has long upheld this truth as exemplified through their myriad unique designs on lighters in just about every store across the country. Some designs tug on personal appeal – such as astrological signs, music themes or sports logos. Others may offer catchy, minimalistic or clever artwork to garner the attention of the artist or intellectual. Of course there is the tried-and-true solid bold color design, many of which have been imbued by social superstitions with their own uniqueness. For example, one such myth claims that solid white lighters are ‘bad luck’. They are just as popular nevertheless, as there are just as many people willing to prove the myth wrong by snatching them up. Regardless of what the design is, every lighter has a design of some kind, whether plain or outlandish – and all of them sell to whom the appeal. 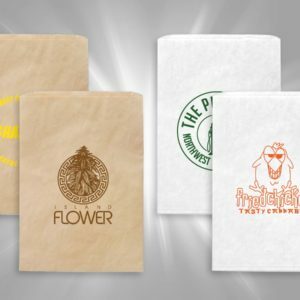 Unique designs are often more favorable because smokers can more easily identify and keep track of them if they happen to get passed around in a group (which they often do and is what we want!). We know that lighters are a key staple in a smoker’s arsenal and that unique designs keep them flying off the shelves. However, the foremost method by which to capitalize on this imperative asset is crafty customization for our own brilliant branding. From the shelf to the dustbin, lighters live a long and dutiful life in service to all the ignitable things that may manifest in both individual and group settings. Some statistical estimates say that, on average, a typical lighter will be seen and/or handled by up to 23 people throughout its life cycle. In some cases, the number could get much higher depending on the social activity of the owner and the lifespan of particular lighters. The key takeaway is that even a single lighter will almost certainly be seen by many, and high visibility is the cornerstone to successful brand-building and marketing. The sharable nature of lighters is already a built-in feature for boosting awareness. All that’s left to do is capitalize on that canvas with creative craftwork for your brand. Don’t let the small size of the printable surface fool you. Thinking big and branding boldly are design applications suited just as well for lighters as they are for posters and billboards. With so many colors, design features and lighter types available, the possibilities are limitless! 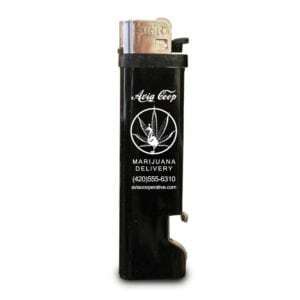 We will customize your desired lighter to your exact specifications and make light up your lighters with pop and pizazz. 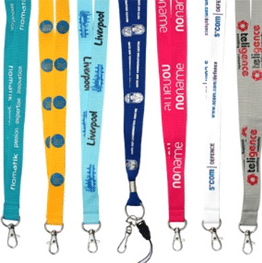 When customers reach your counter, your bold and brilliant branded designs will instantly draw their attention. 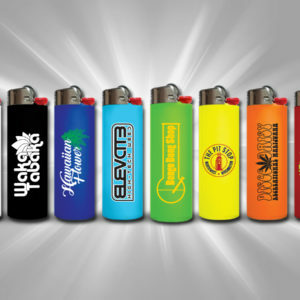 Giving them a wide variety of unique design options sends the message that you respect their desire for individuality and originality in choosing a lighter that represents them. That special feeling, coupled with cool and inspiring designs will put a lighter in every pocket of every patron parting ways from your shop. When every single one of your patrons has your lighters in their pockets, with your memorable branding and logos, you can expect to expand. Remember, it’s not just that one customer using your lighter. Rest assured almost every one of those lighters will get passed around at some point. Better yet, offering extra free lighters can lead to even greater returns. There’s no doubt that custom design branded lighters are superior sellers and work for you long after they’ve been toted off by your patrons. So the only step left is to choose your lighters! We’ve got a plentiful array of products from which to choose. Most shops find that offering a little bit of everything is the best way to go, but you might find that a few popular types in particular will suit your needs. Having long established its top positioning in the lighter industry, Bic has bolstered itself as the standard for quality, durability, longevity and style. From the unique form and feel of a Bic lighter, to its legendary long-lasting efficiency; every smoker knows Bic is the best. Because you’re taking advantage of customized designs for your branding, choosing Bic lighters empowers you to unite your own brand with the best of the best. Having your brand stamped upon the highest quality lighters sends a message to your patronage that your brand respects – and represents – that same level of quality. The undisputed champion in the Bic lighter line, these lighters sell themselves. Durable, reliable, sharable and cost-effective, these lighters are guaranteed to offer a minimum of 3,000 lights. Long-trusted in both smoking lifestyle and utility applications, engraving your branding as a signature series design on our Standard Bic Maxi Lighters is a must-have. 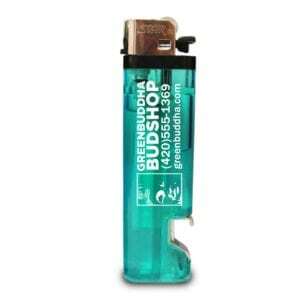 Another popular lighter among Bic’s top of the line offerings is the Bic Electronic Lighter. Boasting the same durability and quality we expect from Bic, this lighter replaces the standard spark wheel and button combo or standard lighters with a simpler single push-button ignition feature. Our Bic Electronic Lighters are guaranteed for 1,500 lights and, as with all of our products, are perfect for custom branding. Some smokers prefer the benefits of electronic lighters over the traditional spark-wheel version. One such benefit is that electronic lighters tend to be more resistant to rain and splash soaking. They tend to light more reliably after exposure to water than their flint-and-steel counterparts. Furthermore, many patrons might enjoy the simplicity and thumb-friendly nature of the single button functionality. Your business (and your brand) will easily win over new patrons, and garner the attention of potential prospects when you offer them variety. You’ll win them all for the long haul when you give them variety that offers the specific advantages and alternatives they’re looking for. Get all the benefits you’ve come to expect from Bic lighters in a convenient, ultra-portable compact size. Don’t let the smaller size fool you, these Bic Mini Lighters still boast 1,000 lights guaranteed, plus plenty of space for your custom branded designs! The compact size of Bic Mini lighters, coupled with the trusted features of the Bic brand are the features driving the high demand for them. On-the-go smokers and those working in service and hospitality roles prize the smaller lighters for their miniature form. Not only do these lighters take up less space in purses and pockets, they take up less space on your shelves and countertops too! That means more room for more lighters, more product and less clutter for your store. With our design options offering a plentitude of eye-catching colors, plus custom printing for your branding and logos, these little lighters will make a big impression. Consider this the lighter that Goldilocks might pick. Not the largest, nor the smallest, the Bic Slim Lighter is always just the right size for anyone. It offers all the benefits of a regular Bic lighter, including the tested quality and durability; plus the sleek and slimmed-down style similar to the Bic Mini – and still offers an impressive 1,500 lights guaranteed. 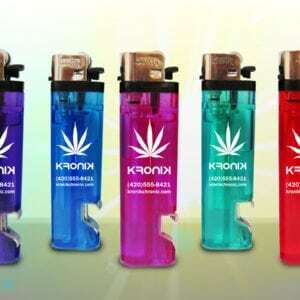 As with our other Custom Lighter design options, you can choose to embellish these lighters with an array of dazzling colors and your craftiest creations to expand your brand. Multi-purpose tools always represent a huge value to customers. A lighter that can open a pop top or beer bottle is no exception, as most smokers know the ‘lighter trick’ for opening bottles when a proper opener isn’t readily available. Although it is technically possible to open a pop-top bottle cap with a regular Bic lighter, no one likes all the scuffs, cracks and scratches that build up on the bottom of the lighter as a result. That’s where these ingenious Bottle POP Lighters come in. Built specifically to serve the additional function of opening bottles, these lighters maintain their primary purpose as a trusty ignition source as well. We offer both Solid POP lighters and Translucent POP lighters in a variety of colors. 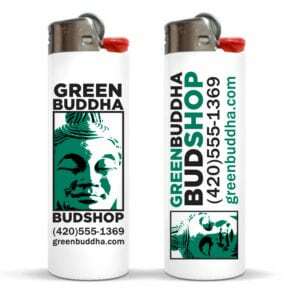 Make sure to apply your custom brand designs on these lighters, as they tend to offer highly sharable exposure. Just one of these lighters in a party setting or a back yard barbecue without a nearby bottle opener will put your brand in the hands of twice as many people! Furthermore, it’s likely to get additional attention as a conversation piece due to its unique design. Another best-selling brand, Clipper is the worldwide leader in refillable lighters. Not only can your patrons refill the fluid in these lighters, but the flints can be removed and replaced as well, all with very minimal mess or fuss. The refillable nature of Clipper Lighters offers tremendous value to consumers because they can extend the longevity of the lighter greatly with substantial savings over disposable lighters. This benefit also translates to longer brand advertising exposure for your business. That’s without a doubt a textbook win-win for everyone. While the refill feature of the Clipper Lighter has helped to bolster its success and favorability, a few other features set it apart in other ways and offer that brand-specific feel that many of your customers find appealing. One such feature is the unique rounded body design with a flat back under the button. It’s a comfortable and unobtrusive feel both in the hand and the pocket, and it’s a signature feature representing classic Clipper style. Furthermore, many smokers enjoy the ease of lighting a Clipper, as the wheel and button tend to require less effort for a light. Make sure to take advantage of the unique round design when applying your custom branding and logo designs to your Clipper Lighters. This form factor also makes for some sleek and stylish display opportunities on your shelves and counter. Finally, we have our Value Lighters series. The attractive cost of these lighters represents the value here, for both you and your patrons. 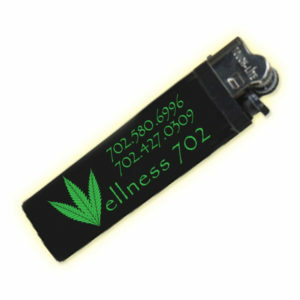 The Custom Value Lighters we offer are the tried and true standard disposable type with adjustable flame. Because of the low-cost economical nature of these lighters, they have the potential to offer perhaps the greatest return for your business. Low price offerings are always imperative at the retail counter. Your customers will appreciate the variety and your attention to more frugal lifestyles. Furthermore, lower cost lighters are less beholden by their owners and therefore much more likely to be shared frequently, given away and often used as the ‘group’ lighter, party lighters, and in similar social smoking settings. 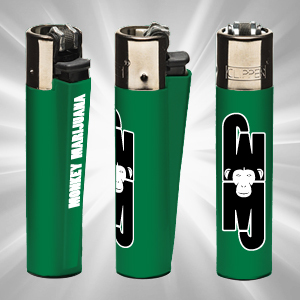 Custom branded designs on our Value lighters are highly recommended as a way to leverage the easy selling and high share-ability of these lighters. Another huge benefit of low cost lighters, especially in conjunction with attractive custom branding is that they’re affordable enough to give away to your patrons for free. Expand your brand even further with one message to those customers who accept the freebie: Tell them to just make sure to Light it, then Pass it On!